The twentieth century has witnessed both the triumphs and failures of the dreams that have informed the modern world. In Utopistics, Immanuel Wallerstein argues that the global order that nourished those dreams is on the brink of disintegration. Pointing to the globalization of commerce, the changing nature of work and the family, the failures of traditional liberal ideology, and the danger of profound environmental crises, the founder of world-systems analysis argues that the nation-state system no longer works. The next twenty-five to fifty years will see the final breakdown of that system, and a time of great conflicts and disorder. It will also be a period in which individual and collective action will have a greater impact on the future than has been possible for 500 years. 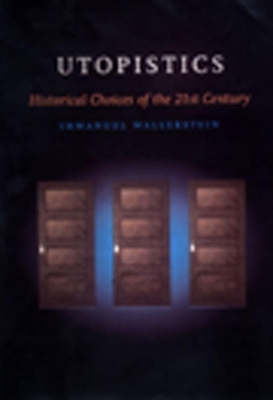 Utopistics distills Wallerstein's hugely influential work on the modern world-system in an accessible way. This fascinating and provocative look into our collective political destiny poses urgent questions for anyone concerned with social change in the next millennium. Immanuel Wallerstein is a senior research scholar in the department of sociology at Yale University and director emeritus of the Fernand Braudel Center at Binghamton University. He is also a resident researcher at the Maison des Sciences de l'Homme in Paris. His many books include The Modern World-System and Historical Capitalism. The New Press has published After Liberalism, The Decline of American Power, and a collection of his works, The Essential Wallerstein. He lives in New Haven, Connecticut, and Paris, France.